The Holidays are a season for lights, they help to bring some cheer to the short, often dreary days. There are numerous lights festivals and displays around Indianapolis during the holidays - The Exhibit at Newfields, the Zoo, the Indianapolis Motor Speedway, not to mention the Festival of lights downtown. 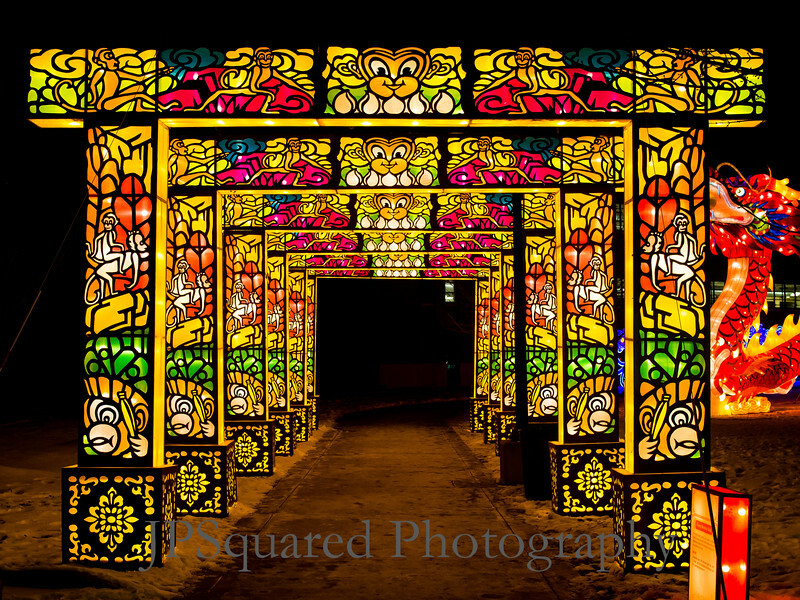 Normally a Lantern Festival (as I understand it) is a spring time festivity, it seems there are now traveling festivals that tour the US from town to town, nearly year round (like circus carnivals of old). Likewise, I associate Lantern Festivals with the release of hundreds or thousands of floating candle lit balloon lanterns carrying the hopes and prayers of their decorators for the coming growing season. These are often very beautiful spectacles captured very well by various travel photographers. I admit - one day I would like to shoot one of these in person. This festival was different. Very enjoyable, but different. The Lanterns were colorful illuminated pieces of nylon animation. There were about 15 different biomes of lanterns each with a different theme. Some were very large: An underwater reef featuring several 3 story jelly fish and hundreds of other sea creatures; A platoon of terra cotta warriors; Various wildlife displays. Some were small and accessible - a set of all the Chinese Zodiac symbols and a pond of frogs on petite mushrooms and lilly pads to mention a few. Another (unintended) feature of the festival was bitter cold. We managed to avoid the -10℉ evenings the prior two evenings, but it was still zero as we walked the grounds. There was a small carnival show, but it was down to 6 performers from a cast of 100's that began in early December, casualties of late December's bitter cold (😉). The performances were fine, I've seen larger Chinese acrobatic shows and this one didn't measure up to the main attractions - the Lanterns. Empathy was felt for the performers who carried on despite the cold, in costumes not meant for a midwestern winter. I took pictures until frostbitten fingers seemed a likely outcome. I have picked of few of the better ones in the slide show below. We had dinner at The Aristocrat in Broad Ripple, finishing our evening listing to live traditional Irish music (Just seemed somehow appropriate 😄). Overall, If such a show travels through your area - expect that it and a nice dinner afterwards would make for a splendid evening.